Mama Mio – Shrink To Fit. 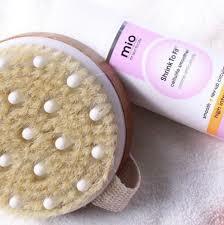 Mio Shrink To Fit Cellulite Smoother helps to improve the appearance of skin. A moisturising cream developed to help reduce the appearance of uneven, bumpy areas. Fortified with a high concentration of antioxidants and caffeine. Its powerful formula is enriched with rosemary extract, green tea and horsetail plant. Ideal for hips, thighs and arms, the lightweight cream penetrates deeply and contributes essential nutrients which can help promote skin elasticity and perfect for those concerned about cellulite. Not for Pregnant Woman.